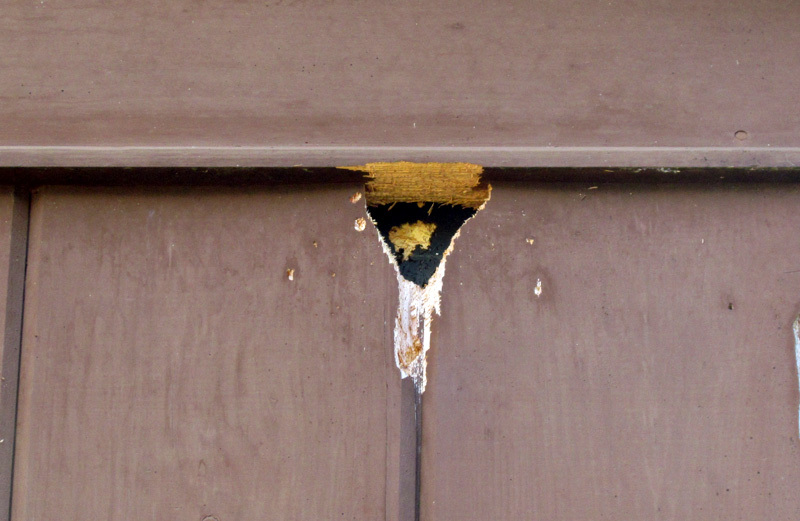 Woodpeckers are eating my house! 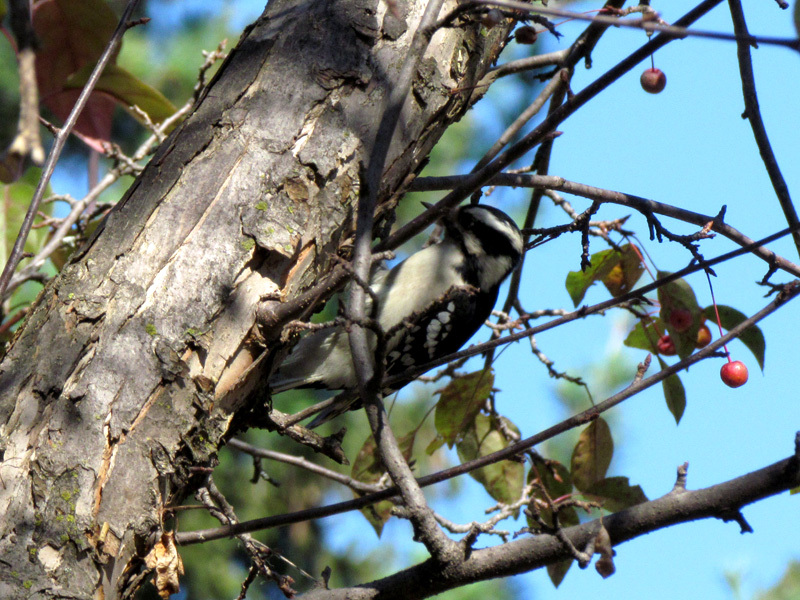 I like birds and enjoy watching them flit around in my yard, but the woodpeckers I once tried to attract to my yard with suet feeders, I now want to exterminate. Here’s what they have been doing to the house this summer and fall. These holes are in the west wall of the 3-season porch, and there are similar drilled sites in the north wall of the new garage. Both are cedar siding; there are no holes in the harder, older redwood siding. So that’s my first clue to what they like — soft, hollow wood. 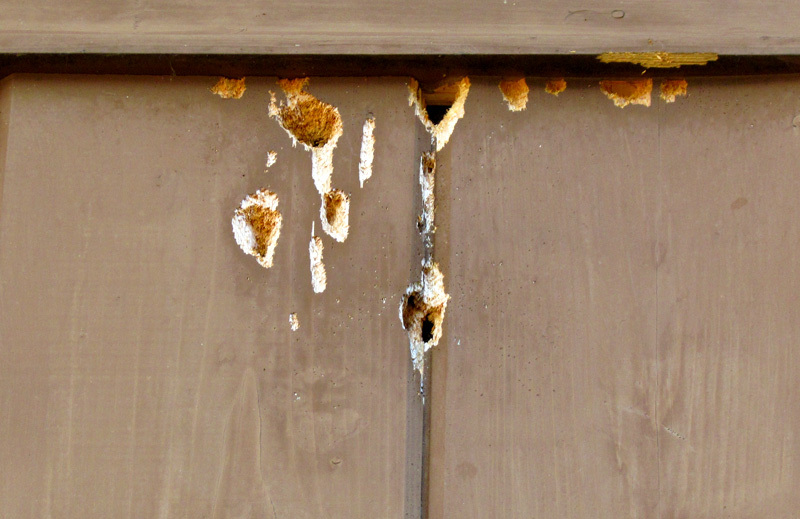 The damage isn’t just in one spot near the eave; there are myriads of tiny holes they have drilled as “experiments” up and down the wall. 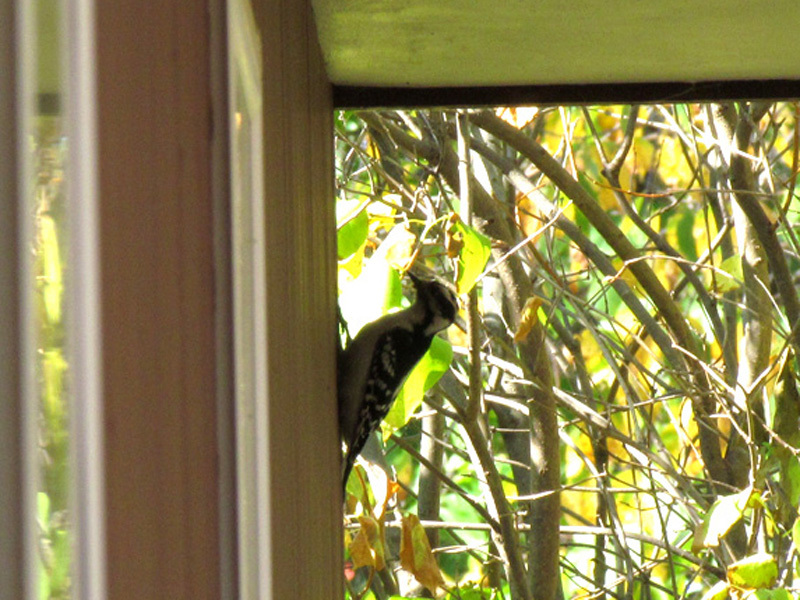 Many people must have this problem because there are many links to “how to control woodpecker damage” on the web. This hole is big enough to be a nest cavity. It might have served that purpose, but I wasn’t paying attention back in the early summer. That’s some pretty impressive drilling. Because it’s soft wood, that sounds good when you peck at it, and they’re bored (my favorite theory because so far I’ve only observed them pecking at the walls on warm, sunny days). I tried to take some pictures of the offenders. They don’t sit still and their little heads are constantly in motion when they’re pecking. Their head vibrates like a jack hammer against the wood 100 times a minute, which makes me wonder why they don’t get a headache. And the deceleration of the head when it actuallly strikes the wood has been measured at 100X the force of gravity. Obviously woodpeckers have some astounding adaptations that permit this lifestyle. The force of the bill strike somehow passes underneath the brain through the bill and neck muscles, which are thick and reinforced to absorb the shock. Reinforced bone in the skull, especially around the eye sockets. Cervical vertebrae with ribs for attachment of these big neck muscles. Incredibly long tongues with barbs on the end for spearing prey deep inside those holes they are drilling. The tongue support actually wraps around the back of the skull under the skin, when the tongue is retracted. Two toes point forward and two point backward to help brace the bird in a vertical posture on the tree. The stiff feathers in the tail are also used as vertical braces, allowing the bird to lean far away from the tree and accelerate its head rapidly forward to strike with maximum force, like this. Almost cool enough for me to forgive their destructive habits. It’spretty incredible footage and description. Too bad, it looks like it’s your new addition ! I can sure tell you a lot about the western woodpecker and how destructive they are. We have holes drilled in the wood parts of the old house as well as the fascia boards and roof beams at the new house. It looks like someone took a machine gun to the old house frame! We definitely don’t feed them! They look much different from your woodpeckers – ours having very red heads. They place the acorns in the holes drilled, pointed end first, wait for worms to drill into the acorn then extract the acorn and pull out the old acorn. This is repeated over and over!